www.American-Rivers.com provides information to the California whitewater rafting community about the American River Canyons. 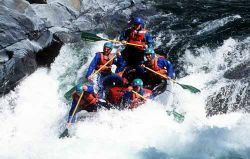 This public resource features river descriptions for whitewater rafting, river access and shuttles, camping and a general overview of each river canyon. The in-house web development team at All-Outdoors California Whitewater Rafting has created this website in partnership with Protect American River Canyons (PARC) to serve as an educational and informational resource for guests, guides and the general whitewater rafting community. Portions of www.American-Rivers.com were excerpted from The American River: A Recreational Guide Book, for the purpose of promoting conservation issues regarding the American River Canyon. Many of the photos on this site have been reissued from the All-Outdoors photo archives from Rapidshooters of Coloma, California. Unless otherwise specified, all content provided on this site is for your personal and non-commercial use. You may not modify, copy, distribute, transmit, display, perform, reproduce, publish, license, create derivative works from, transfer, or sell any information, products or services obtained from the American-Rivers.com website, or any affiliated content provider, without express permission from the original authors.